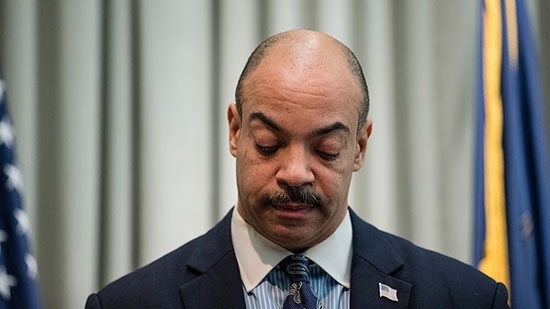 Philadelphia District Attorney Seth Williams has been indicted on additional fraud charges. NJ Acting U.S. Attorney William Fitzpatrick said on Tuesday that the new charges come from Williams' alleged use of political action committee (PAC) funds and official government vehicles for personal benefit. He is accused of using campaign funds to buy birthday presents for his girlfriend, along with massages, facials and clothing from a health club. He also used city vehicles designated for an anti-drug-trafficking program for his own personal trips, sometimes out of state. On this superseding indictment, Williams is now charged with 11 counts of bribery, two counts of extortion, 14 counts of wire fraud and two counts of mail fraud. That's 29 in total, up from 23 in March. He remains in office but has had his law license suspended pending the outcome of the charges. The trial is set to start May 31st. President Donald Trump fired FBI Director James Comey on Tuesday afternoon. A brief statement from the White House Press Secretary said that the president acted on recommendations from both Deputy Attorney General Rod Rosenstein and Attorney General Jeff Sessions. Comey was nominated for the position by President Barack Obama in 2013. This past year the top law enforcement post has seen high profile scrutiny from both sides of the aisle. The conservatives did not like Comey's decision not to pursue charges last summer against Hilary Clinton for her use of a private e-mail server, but his decision to reopen the case with a letter to Congress just before Election Day may have pushed the tide in their favor. Since the election, liberals have been clamoring for an independent investigation into possible Russian involvement in our political process. The search for a new FBI director will begin immediately. Bensalem High School was evacuated on Tuesday afternoon after a chemical spill in a science lab. It happened around 1 p.m. A container of formaldehyde was leaking in the classroom. Hundreds of students and staff were evacuated to the stadium bleachers. The Bucks County Hazardous Incident Response team responded to the scene. Members donned hazmat suits and entered the building to clean up the spill. Medical personnel checked anyone who had been near the leak, but no one needed treatment. School was dismissed at the regular time.